How to transfer OS from one computer to another in Windows 10, 8, 7? AOMEI Backupper Standard can hep you to do it freely without losing data. Why you transfer OS from one computer to another? With time goes by, your computer becomes slower and slower so that you can’t wait to change a new computer. However, you would not willing to abandon the old system that you were used to, and maybe you want to keep the old system and applications. Thus, transfer operating system from the old computer to a new one is the best way to keep the old data. Besides, there are many other reasons that you want to move OS from one computer to another, for example, saving time for installing system and applications for a new PC. When you try to migrate the OS from one computer to another, you will find that simply coping your operating system from one hard drive to anther doesn’t work, because the computer cannot boot. Trying to install the hard drive with existing OS into another computer may cause many problems as well. The biggest problem is that It has a big security threat that the system may crash accidentally. How to transfer OS from one PC to another? To transfer OS from one PC to another and ensure that the another PC can boot successfully isn’t a simple copy. Here we highly recommend you to use AOMEI Backupper, an amazing software that has a great utility called Universal Restore, which can help you do this job easily and safely. ★ Install and launch AOMEI Backupper. ★ An external hard drive (not necessary). You can use it to create bootable media and store the system backup image. If you do not have one, you can use the network attach storage (NAS). ★ Create a system backup image of the computer with operating system. Remember where you store it. The external hard drive, or share it on NAS. Here we choose share on NAS, remember the path you input. ★ Create a bootable media if you used external hard drive, or you can use AOMEI PXE Boot Tool to start up the computer with in LAN through network. Step1. Use the bootable media or the AOMEI PXE Boot Tool to start up the computer. Step2. 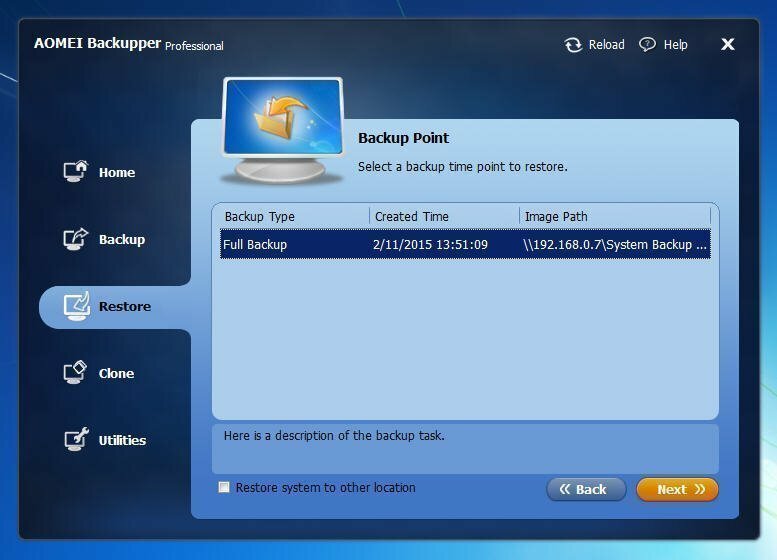 Click Restore, and click Path to find the system backup image you created before. Step3. 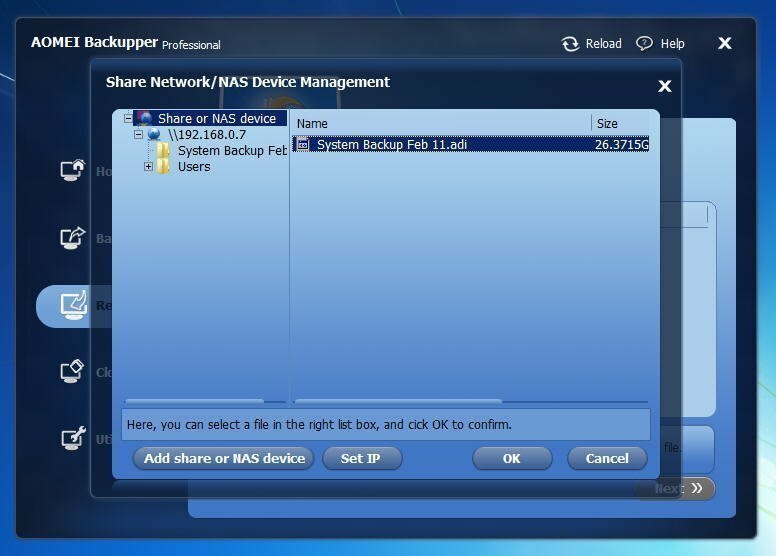 As we stored the system backup image to the NAS, here we click Share/NAS and input the IP you typed before, and click OK.
Step4. 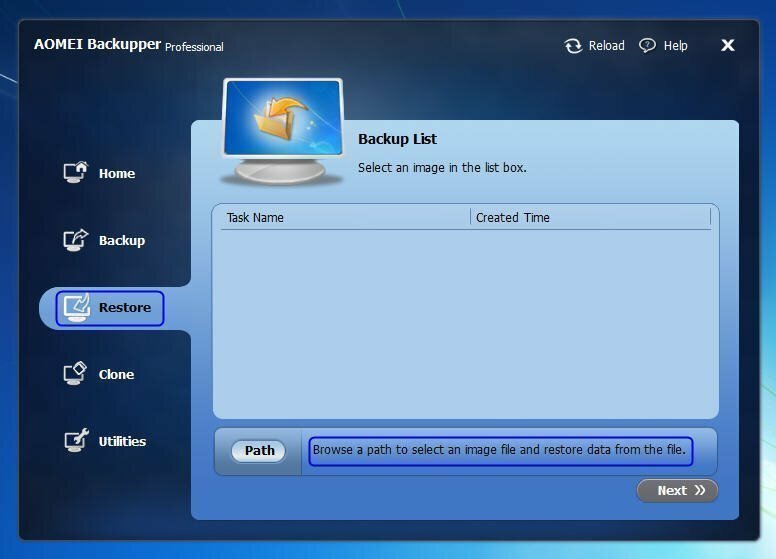 Select the target image at the Backup Point page and click Next. Step5. Here, choose the destination place to restore the system on. Click Next. Step6. You can confirm all the operations at the Operation Summary. If there is no problem, click Start Restore to execute. ● Here you need to tick the box in front of “Enable Universal Restore”. 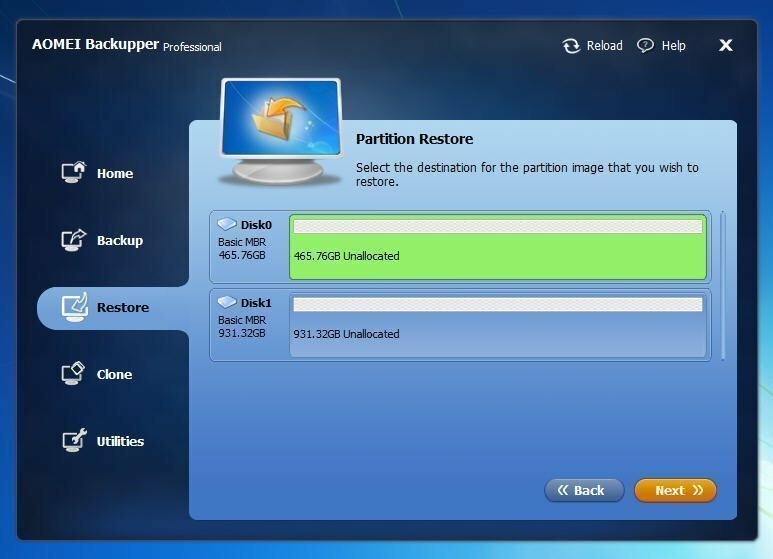 ● You can edit the size of the partition before clicking Start Restore. ● If the storage device on the computer is solid state drive, you can tick the box in front of Align partition to optimize SSD, so that it will get in the best statement after restoring. ● AOMEI Backupper supports all the Windows OSes including Windows 7/8/10, etc. Wait till the progress reaches 100%, and click Finish to exit. Then, you can boot this computer normally with the same operating system with the original computer. AOMEI Backupper will remind you if your operation has any effect to your existing data. So you needn’t worry about the data loss. AOMEI Backupper has many other utilities that you can use and you can download the free edition AOMEI Backupper Standard.